A journey to remember filled with the tastes and sounds of the south. This 10-day itinerary takes in the musical cities of Memphis and Nashville. 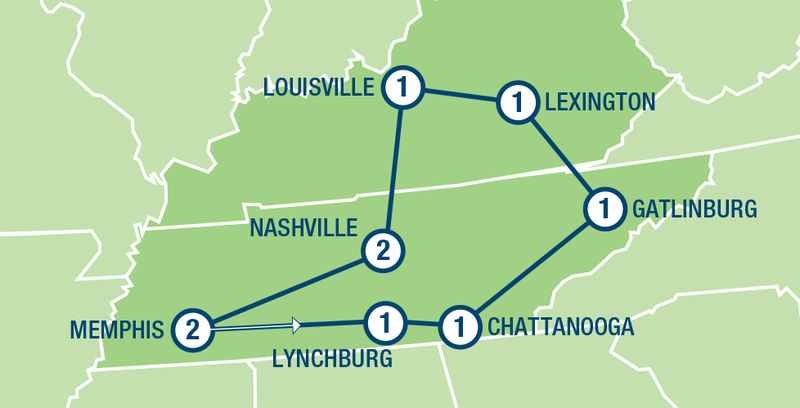 Other highlights include optional visits to the home of Jack Daniel’s whiskey, the Chattanooga Choo Choo train, the location for the world famous Kentucky Derby and more. Upgrade your car! Download all the upgrade options below. Your itinerary includes 9 nights standard 3 star accommodation, welcome kit with maps, driving instructions and suggested stops and sights. Rental Car price is based on two adults renting a Compact Alamo car for collections 1-10 Apr, 22 Apr – 30 Jun, 16 Aug – 14 Dec 19 & 1 Jan – 31 Mar 20.